This salad was tossed together at the last minute, but my family loved it so much that I knew I had to share it with you. I’ve had similar salads made with strawberrries and spinach, but I’ve never seen one with apricots and cabbage. I was delighted to discover that they were such a tasty combination, especially since I happen to have a lot of both right now. 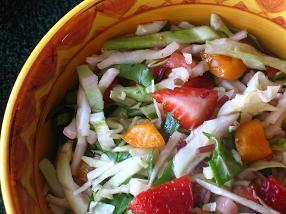 This salad is loaded with nutrition, color and taste. Chop fruit and vegetables and mix in a bowl. Whisk together the dressing until sugar is dissolved. (If you don’t wait til sugar is dissolved, a family member may feel the grit between his teeth and accuse you of not washing the greens. Just sayin’.) When dressing is mixed, pour quickly over salad and toss to coat evenly. Grab your portion of this salad immediately or you may not get any. Especially if you have a 12 year old daughter who goes back for more four seven times. Oh Mary, this looks divine!! I am going to try this one. I need to search for apricots! This looks delicious! I love so many of the recipes that you’ve posted. The Jazzy Ramen Stirfry is always a hit at potlucks. I’m bettin’ this will be too! Ohhh! That looks yummy. I love summer salads. Reason #3000 to hate Typepad…I changed your addy in my blogroll, but when I click it, I still get sent to your old blog!! Grrrr….gotta get hubby on it…maybe he can figure it out. No worries…now I have you bookmarked. I updated my reader – for some reason, when I did it the other day, it didn’t take! Was wondering where you were! I added your new feed to my Flock reader, so now I’ll be joining you here each and every time. Are you going to put the ‘blogs I enjoy page up again? I hopeso – as I read several! Love the new look – and the recipe picture is making me hungry! The salad looks divine – I can’t wait to try that dressing. And I like your new digs! I have your link on my side bar and have changed the address. I like your new digs. I love the updates from Ethiopia … keep ’em coming! Very interesting and simple. So many things that you wouldn’t think would go together, but do!